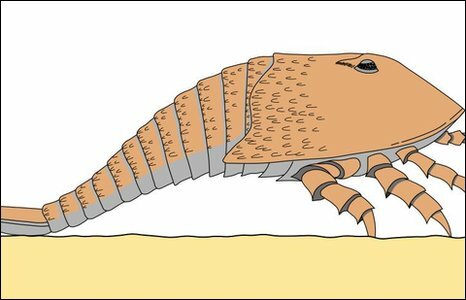 The tracks were made by a giant six-legged "sea scorpion" called Hibbertopterus as it crawled over damp sand about 330 million years ago. Scottish Natural Heritage, which is funding the project, described the find as unique and internationally important because the creature was gigantic. It said the fossil would be moulded in silicone so that more people could see and research it. Richard Batchelor from Geoheritage Fife, said: "The trackway is in a precarious situation, having been exposed for years to weathering. "The rock in which it occurs is in danger of falling off altogether. "Removing it and housing it in a museum would be prohibitively costly but moulding it in silicone rubber and making copies for educational and research purposes means that we can still see and research this huge creature's tracks in years to come." This contrasts previous fossil evidence which suggested that the creatures lived in the water for most, if not all of the time. SNH geologist Colin MacFadyen said: "Helping to conserve this important find is vital for our understanding of this period in evolution. 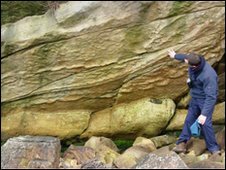 "Such finds as this highlight that all over Scotland there are no doubt other geological treasures awaiting discovery."